Success Rehabilitation has joined a growing movement of changemakers that use business as a force for good. 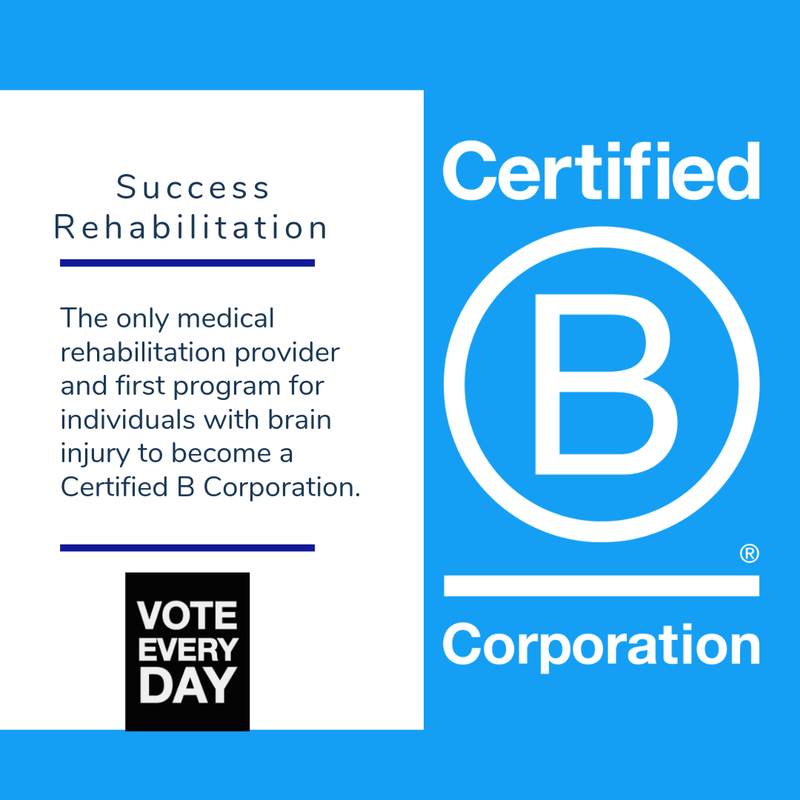 As of today, we are the only medical rehabilitation provider and the first program for individuals with brain injury to become a Certified B Corporation. B Corp certification is the ultimate gold standard and only awarded to businesses that meet the highest standards of social and environmental performance, transparency, and accountability to balance profit and purpose. We’re all familiar with how pioneering brands like Patagonia, Toms, and method use the power of business to address social and environmental problems. Their business practices foster community amongst team members and strengthen a loyal consumer base built around shared values and beliefs. These companies are also Certified B Corporations. This designation is much like a Fair Trade or LEED certification and signals a commitment to making a profound social difference, safeguarding people and meeting higher standards of transparency, performance, and accountability. We are proud to join a community of over 2,778 Certified B Corps, in 150 industries and 60 countries around the globe who are redefining success in business. Why did we become B Corp certified? Our journey to becoming a B Corporation started several years ago when our talent team identified the need for an additional framework to recognize our social impact. We learned that the B Corporation movement reflects similar core values upon which our company was founded twenty-nine years ago. In fact, we have been operating as a social enterprise since 1990, always putting people before profit. This was well before the birth of B Corporations or the popularly of the socially conscious business model. As a company, we’ve made it our mission to create new opportunities for those who have experienced brain injury, and becoming a member of this new sector of B Corporations allows us to learn from like-minded people and increase the awareness for the entire brain injury community. 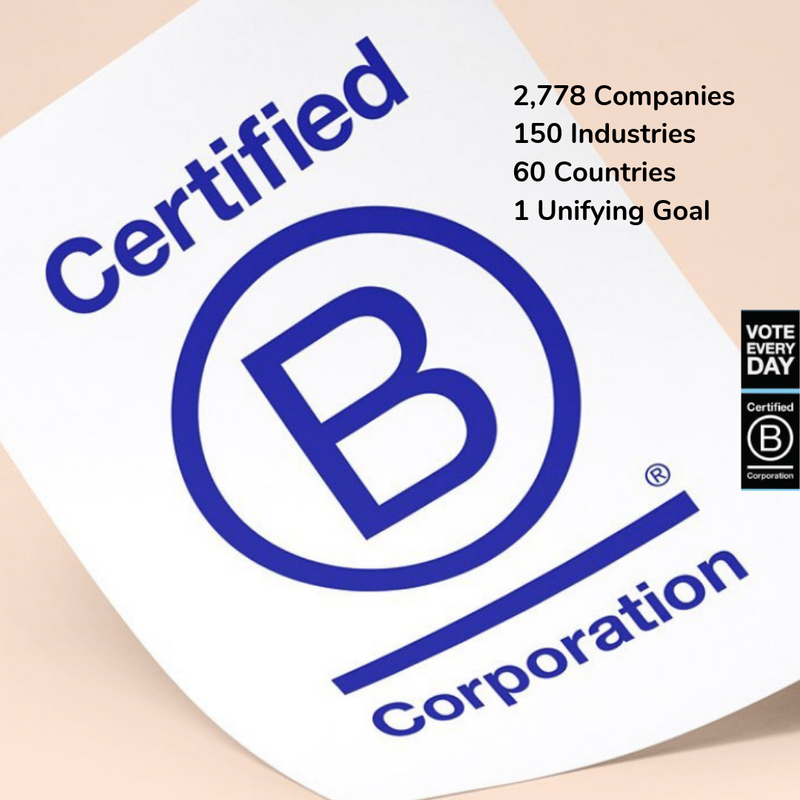 B Corp certification is a celebration of the profound social difference that our team, family members, and partners make on the brain injury community. This certification sets us apart and provides us with a roadmap to becoming an even better company over the years. There are many reasons why we decided to become a B Corp. One of our key drivers was to attract and retain key talent who are looking for more than just a paycheck. As they seek greater purpose and a company that aligns with their values, B Corp is a way to show our shared commitment. It is also a stamp of approval, telling our employees, partners, clients and their families that we are dedicated to higher standards of performance and transparency. The certification holds us accountable by comparing us to some of the best companies in the world and providing a roadmap for improvement. It gives us the opportunity to partner with like-minded companies around the world! The non-profit B Lab certified Success Rehabilitation after a rigorous evaluation of how our practices impact our employees, our community, the environment, and our customers. This evaluation is called the B Impact Assessment and has a maximum score of 200 points. Though any sum of points is a good thing, most companies land between 40 and 100 points total. A company must earn at least 80 points to qualify for B Corp certification. On our first attempt, we have finished with a score of 134.2. We are thrilled with this initial score and will remain dedicated to improving our efforts before the three-year recertification process. What are some of the practices that earned this Certification? Our operating model improves the livelihood of our TBI community. 5 CARF Accredited programs, verifying the positive outcomes. Top 25% in the industry for base compensation structure. 11- 20 hrs spent per team member on training and education. 4%+ contribution to our employee profit sharing plan. 10+ years average tenure for the professional team. 25%+ team growth in the last 12 months. 78% of our management are women. 75%+ of our suppliers are independent locally owned companies. 95%+ of our team members live locally. We are proud to join a community of over 2,778 Certified B Corps around the globe in redefining success in business. We look forward to learning from, partnering with, and lending our voice to this passionate community of businesses that balance purpose and profit. To learn more about our certification check out our B Corp profile. Award-Winning post acute rehabilitation facility offering residential & outpatient services for traumatic and acquired brain injury survivors. Quakertown, PA.